In the wake of the death of Freddie Gray while in police custody in Baltimore, Maryland, the subsequent actions of the DA and Mayor and the arrest of police officers, May 2015 was the deadliest month in Baltimore in over 40 years, since 1972. Who didn’t see this coming? Add 106 shootings as well and the number of arrests down. Following the death of Freddie Gray, six officers were charged with charges that range from second degree depraved murder for the driver of the van to manslaughter to misconduct in office to false imprisonment for others. And then there was the ensuing riots that took place in Baltimore where the Baltimore Mayor all but told the police to stand down and let the mob loot and burn the city. 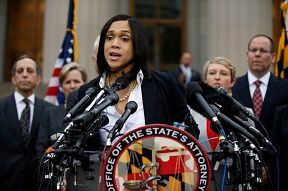 But of course this is just a coincidence that on the foot-heals of State’s Attorney Marilyn Mosby seemingly all too gleeful in appeasing the mob, rushing to judgement and taking sides rather than standing for the rule of law. 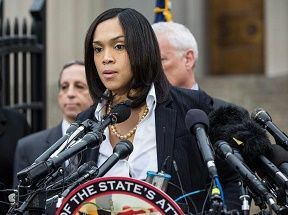 Many have thought that Mosby grossly overcharged the officers and is going to face issues down the line during the trial of these officers. May 2015 being the deadliest month is also a culmination of decades of failed liberal policies. With three men killed in eastside shootings on Sunday, Baltimore recorded its deadliest month in more than 40 years. Speaking at a morning ceremony to honor McKenzie Elliott, the 3-year-old killed by a stray bullet in August, Rawlings-Blake said it’s time to stop finger-pointing and assigning blame for the recent violence. This weekend former Gov. Martin O’Malley announced that he is challenging Hillary Clinton and Bernie Sanders for the Democrat nomination. As stated at The Other McCain, this is Martin O’Malley’s legacy of failure to Baltimore, MD. It kind of makes one wonder how he thinks he is going to run for the Democratic nomination for President with this track record of failure. Then again, it is the Democrat Party. The question still remains for me, is she appeasing the protestors, or are the charges based upon the evidence? Let’s hope she’s hearing all the evidence and not just the protestors. 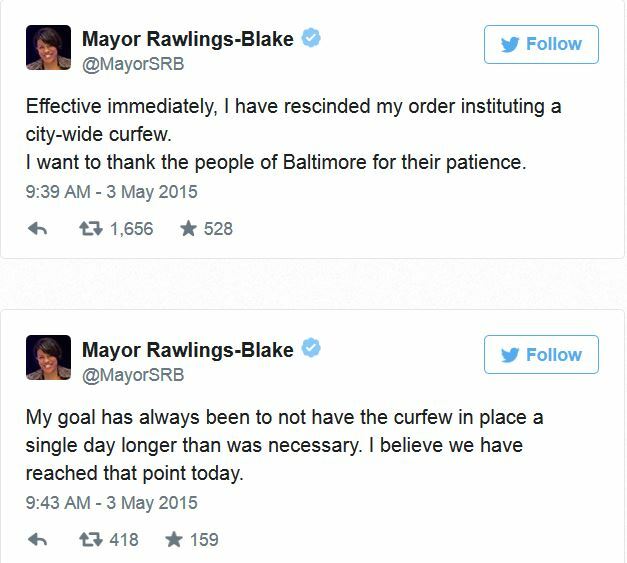 Baltimore Mayor Stephanie Rawlings-Blake announced today, Sunday, May 2, 2015 that she was lifting the 6 day curfew imposed after riots ensued using the excuse of the death of a black man, Freddie Gray, who sustained a spinal injury while in police custody. Mayor Stephanie Rawlings-Blake has mishandled and botched the handling of this situation from the outset. Her naive and foolish agenda to have police stand down and not protect her city resulted in the lawlessness, rioting and mob violence that saw businesses looted, burned to the ground and police officers injured. 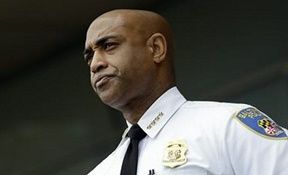 Baltimore Mayor Stephanie Rawlings-Blake announced Sunday that she was lifting the six-day curfew imposed after riots ensued over the death of a black man who sustained a spinal injury while in police custody. The announcement came a day after thousands gathered Saturday outside City Hall, where heavily armed police and National Guard were stationed, in a tense but celebratory demonstration. The 10 p.m. curfew remained in effect that night. Tensions eased after the Friday announcement of charges against six police officers in Freddie Gray’s death. So this clueless and over her head Mayor thinks that mere charges against the police officers are going to quell the lawlessness, really? As it was, she waited too long to put a curfew in place as she allowed the thugs and punks to overrun the city as Mayor Stephanie Rawlings-Blake gave the police a stand down order. Over 200 businesses were lost and burned thanks to an idiot Mayor giving the rioters their space to destroy and let them loot because it was only property. If this mayor actually thinks that Baltimore has been reunited, she is a fool. From all accounts and comments that we have heard from the protesters, the issues of Baltimore were present prior to the death of Freddie Gray and they are still present. The Mayor is just lipsticking a pig and trying to put a happy face on a bad situation that has existed for decades. There is no way the mob will be happy with charges against the police officers, they want scalps. Just curious, what happens when the police are found not guilty? With all due respect the the politicians, both Democrat and Republican, you are going to need a lot more than prayer, peace and reflections to fix Baltimore. Your average person would not go near Baltimore because in order for you to claim it is safe, the National Guard is still present and hundreds of extra police have been called in. Also, there is still massive unemployment and a culture of dependency on government. Until that is addressed, nothing is really being done to remedy the situation.